Another new formula to play with, another Crystal Bead Bazaar bracelet challenge to enter: guess what I managed to combine … again … eventually! I was incredibly late with my entry but … better late than never! Botanical influences. OK! I enjoy making flower-designs. Settings that included Green + White + Violet stones as a code for Give Women the Vote. Yes! I am delighted to do include those too. The result: I made my own flower-beads out of Hadar’s Friendly Rose Bronze, set them with Green (nephrite jade), White (cz), and Violet (amethyst) stones, strung them on copper wire, connected everything with bronze jump rings (and a bronze clasp, not shown). If you like it, I’d sure appreciate your voting for my entry. Yes, once again, the last weekend in April brings the wonderful event known as Art All Night. As ever, it’ll be in the Lawrenceville neighborhood of Pittsburgh. This year, it’s going to be held in the same location as it’s been the last two years: just east of the 40th Street Bridge, down next to the Allegheny River. If you’re not familiar with the event, it is an absolutely amazing community-based celebration of art! The show will open at 4:00 pm on Saturday, run through the rest of the afternoon and evening, keep going all night (yes, really! ), run on into Sunday morning and early afternoon. After tens of thousands of people have explored the exhibits, listened to the music, watched demonstrations and joined in on the various hands-on activities, it will finally close at 2 pm on Sunday…. I include a photograph of the piece I’m entering this year: The Pittsburgh Point: Three Neighborhoods and Three Rivers in Three Metals. 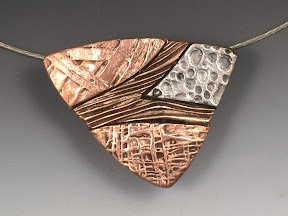 It was made using Hadar’s Clays: Champagne Bronze, Friendly Copper, and Low-Shrinkage Steel. It is, in fact, extra-special to me because I made it in the Accreditation Program workshop I attended out at Hadar’s Studio in Berkeley, CA, this past February. (Hadar herself took this photo with it on a steel cable she had out there! I’m entering it with a bronze-color satin cord to which I added findings.) I really enjoyed making it. Better yet, it inspired me to start a whole new series of Three Rivers pieces for the Three Rivers Arts Festival this June. I’ll again have pieces in the Koolkat Gallery booth there … but I’ll write more about that later on. Until Sunday afternoon, I’m all Art All Night! Let me know if I should look for you there! In addition to the workshops I’ve offered in fine silver for what seems like ages now, I’ve also been teaching classes in these non-precious metals too, mostly on-demand private or semi-private sessions, plus a few in local bead shops. All were relatively short, covering just one or two techniques in one or two day (or evening) events only. Now, I’ve taken the best of the best and spiffed them up with some of the things I’ve learned in the last year with Hadar’s group of teachers worldwide. And I’m thrilled to be offering that great new combination in a four-session series, on Sunday afternoons in May, in my studio in the Regent Square (Swissvale) neighborhood, just east of Pittsburgh, Pennsylvania. Whether you’re a beginner, or already have some experience with metal clay, you will make at least four separate items: a bracelet, a pair of earrings, and two pendants. Some may involve a single metal; others will combine various bronze formulas with copper and/or steel. You’ll learn every step of the process, from design through basic construction and on to final finishing for your pieces. You’ll get to use at least three different metals (from yellow bronze, champagne bronze, dark champagne bronze, iron bronze, rose bronze, copper, and/or steel). Don’t know the difference between them? You’ll learn that too! We’ll meet each Sunday in May (4, 11, 18, and 25*), from 12 to 5 pm. That’s 20 whole hours of instruction in a small class (max 6 students)! * Yes, May is such a busy month! We will meet on Mother’s Day. But let me know if you’re hesitant to sign up simply because May 25 is part of the Memorial Day weekend. Several alternatives for that final date are possible!